If you drove yesterday and there were no cracks - today double your attention! Ice rings are an additional danger, as it is difficult to forecast their appearance and (in contrast to usual cracks) to detect them when driving. Basing on our detection of ice rings on satellite images we recommend to avoid all the places where ice rings were detected previously. 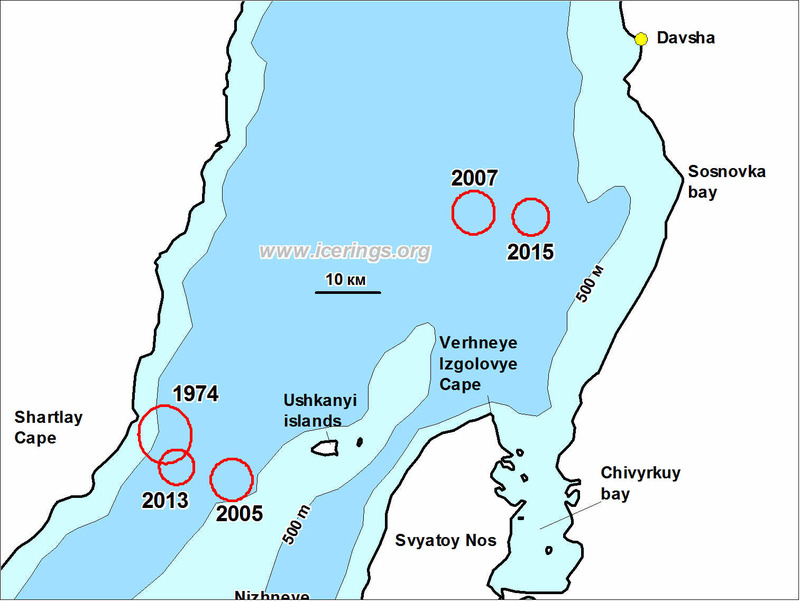 Location of ice rings between Davsha and Ushkanyi islands Numbers show year when ice rings were detected. More details and coordinates are in the Table (section "On rings"). Click on image for higher resolution. f) Region near Cape Nizhneye Izgolovye and between Nizhneye Izgolovye and Cape Hoboy. Ice rings between Svyatoy Nos Cape and Ol'khon island. Numbers show year when ice rings were detected. More details and coordinates are in the Table (section "On rings"). Click on image for higher resolution. 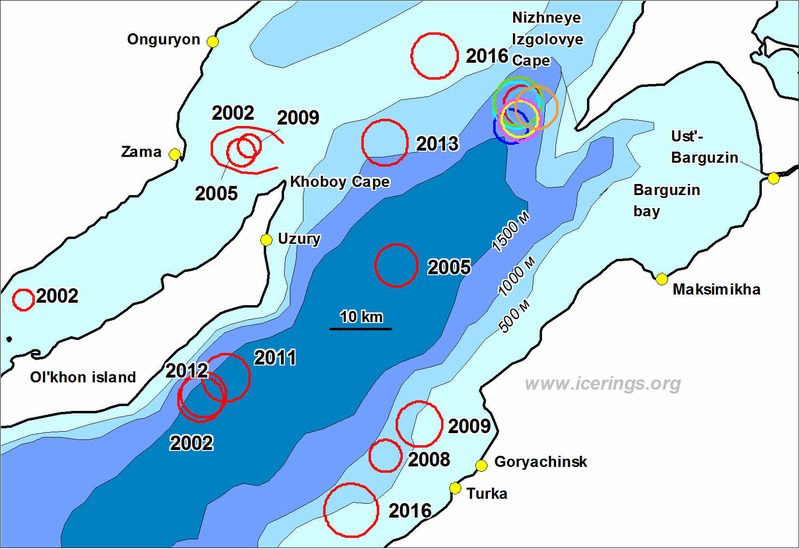 Region near Nizhneye Izgolovye Cape is especially dangerous, ice rings appear here quite often and they are located almost in the same place. You may download boundary of this region in kmz (Google Earth) and gpx (для GPS) formats. Though most ice rings appear in April-May, here ice rings were also observed in mid-March (2016) and in the beginning of February (2009). 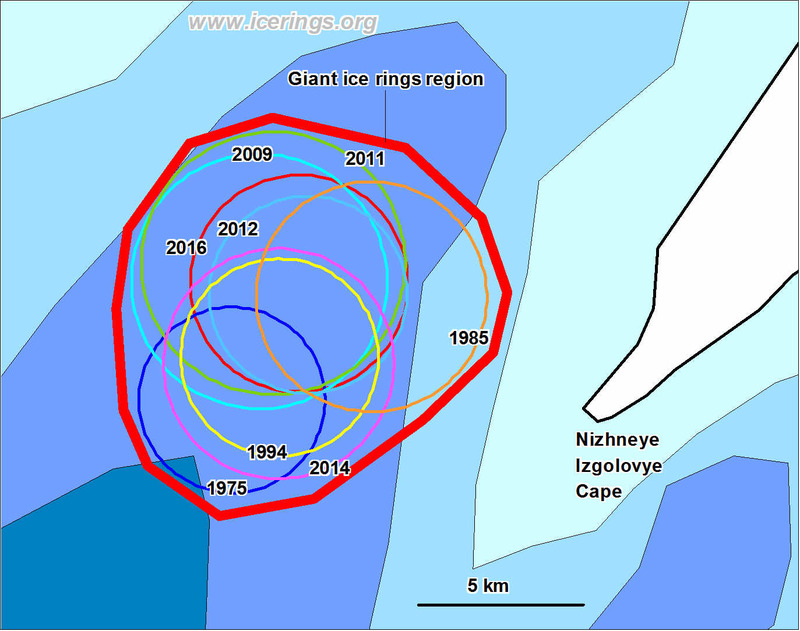 Scheme of ice rings locations near Cape Nizhneye Izgolovye. Numbers show year when ice rings were detected. More details and coordinates are in the Table (section "On rings"). Click on image for higher resolution. 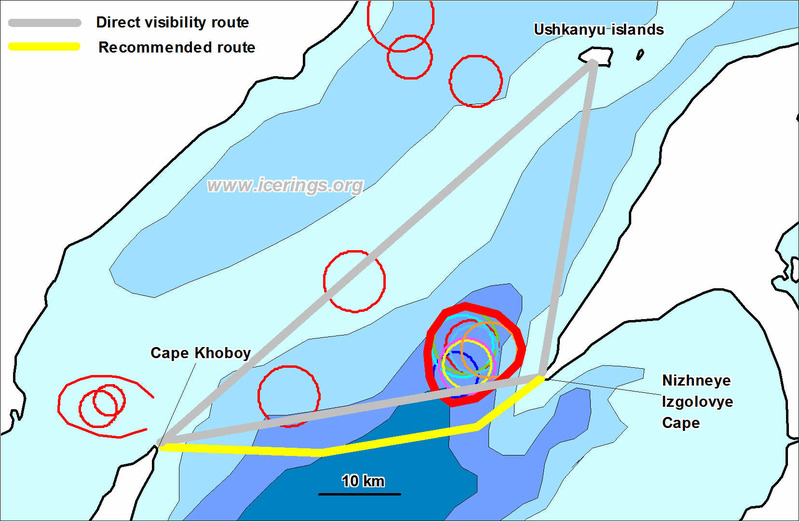 Lines of direct sight between Cape Nizheye Izgolovye, Cape Khoboy and Ushkanyi islands. Click on image for higher resolution. We strongly recommend when driving between Cape Nizhneye Izgolovye and Cape Khoboy follow the route that goes more southward (yellow line) to avoid this dangerous region.